Home | News & Events | Articles | What is Education with Character? Banstead Prep opened its doors in September 2017 as a new, co-ed Prep school. This presented an exciting opportunity to create a school with the vision, ethos and culture tailored for children of this age range, prepare them academically for their next phase of education and, equally, value their personal development. Starting the school from scratch meant that curriculums and timetable allocations could be created to fit our ethos. We have long, fast paced and full school days and we maximise use of our senior school standard facilities. All year groups benefit from extensive specialist-taught Sport, PE and Swimming, as well as Music, Drama, Art, Languages and Computing. 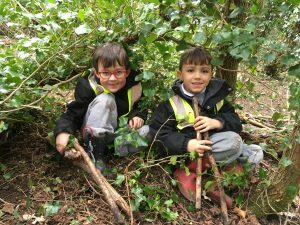 Nursery to Year 2 enjoy an afternoon of Forest School, whilst Years 3 to 6 follow a bespoke Life Skills curriculum in which the children alternate between Food Technology, which is often linked to other curriculum areas such as Humanities and other wider curriculum areas such as Textiles, DT, PSHCEE, Economics, Enterprise and Study Skills. Many projects and activities in Life Skills are completed in groups and with minimal adult input to encourage problem solving, collaboration and communication skills. Education with Character is the ethos that sits at the very heart of our school and forms the core of what we believe – there’s more to a good education than learning. It defines what we are and how we are different from other schools. 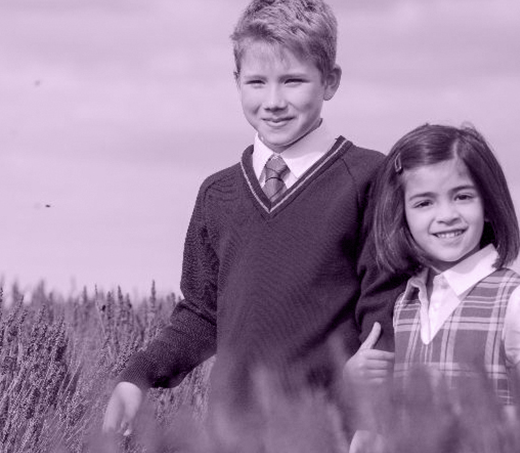 We want Banstead Prep to be known for dedication to providing academic excellence through a broad and varied curriculum, equipping children with skills for life, while helping each of them grow in character and be the best they can, every single day. We believe happy children learn best and confident children go far. We want our children to look back on their time at Banstead Prep as happy, varied, inspiring and above all exciting, to have developed a love of learning, found a passion for something – whether inside or outside the classroom and have the courage and academic foundations to embrace their move to senior school, wherever that may be. So what does Education with Character look like in practice at Banstead Prep? When you visit our school you will be greeted by happy, confident children who are proud of their school and want to tell you about the wealth of exciting things they are learning about, visits they are looking forward to and clubs they attend. 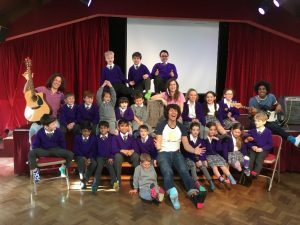 You’ll find that the children have the confidence to stand on stage to perform in assemblies, concerts and performances, right from the EYFS because these skills are embedded into school life and are ‘normal’ for the children. Our sports for all ethos and encouraging sports staff enable the children to participate willingly, regardless of sporting prowess. Equally, although we love to win our fixtures, sportsmanship is consistently encouraged and the children conduct themselves in a mature manner when away at fixtures, or hosting at home. After Forest School, the excitement of Year 2 explaining they’d found a meteor in the forest. 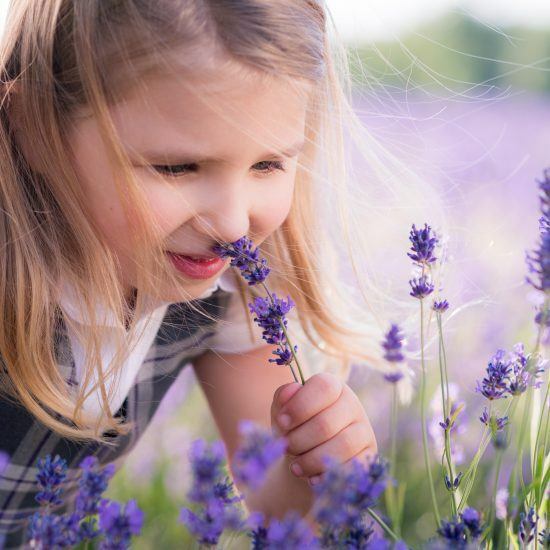 These sessions are a chance for the children to learn how to behave, take risks and use their imaginations, all of which are skills which are needed across the curriculum. These imaginative opportunities are vital for children’s creativity later on and we fully anticipate reading creative writing based in a forest featuring meteors from this year group in the future. Our life skills curriculum has enabled a wealth of cross-curricular learning. An excellent example of this is the Year 6 ‘Ready Steady Cook’ challenge. The children went to the High Street and in groups had a budget to spend on ingredients to make dishes of their choice. Back at school the groups collaborated to decide what to create and use teamwork to make it all happen. 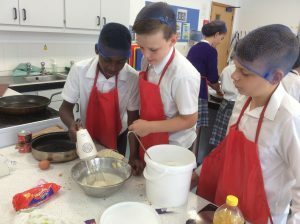 Many used recipes from previous life skills lessons and cookery clubs, as well as experimentation to create their masterpieces. The ‘judges’ then awarded points for effort, taste, presentation, and tidying up and points were deducted for teams who went over budget. Whilst the children might have just thought they were cooking, this is a fantastic example of problem solving, collaboration, communication, mathematical skills and for some tenacity all in one activity. In practice, Education with Character is the core ethos of the school and therefore the curriculum and timetable allows for its development – through a wide range of timetabled subjects, dedicated time for ‘off-piste’ subjects such as our bespoke Life Skills curriculum, as well as a wealth of trips, visits, residentials and speakers during the year. Commitment from the top is key, our Leadership Team completely believe in it, and support other staff to deliver it. All schools feel the pressure of exams, it’s a huge factor when prospective parents choose a school and how we are judged a success. We do not do SATs but all our children have to sit entrance exams for largely selective Senior Schools and Grammar Schools in the Autumn Term of Year 6. One thing we pride ourselves on at Banstead Prep is our wider curriculum. We believe that the high-quality teaching that takes place during the timetabled core subjects is sufficient for exam preparation, therefore time dedicated to Sport, Music Drama, Life Skills, Art, and Languages are not reduced due to exam pressures. All these subjects are equally valued. The key to the success of Education with Character is the staff team. Subject planning embraces Education with Character, and staff have the freedom to do something a bit different, follow the children’s interest and deviate from medium term plans. As well as subject areas embracing Education with Character and a broad co-curricular programme offering the introduction to a wealth of other activities, it’s really important to have whole school events in which all children and staff are involved. Right from the very beginning we involved all of the children in our opening ceremony where we raised the BPS flag, planted commemorative trees and shared our first birthday cake. We have had several examples of such events since opening: The whole school threw ourselves into Odd Socks Day, raising awareness of the Anti-Bullying Alliance, resulting in BPS being selected as one of only ten schools to receive a personal visit from Andy and the Odd Socks, we’ve had whole school Christmas pantomime trips and visits, Easter Egg hunts and a whole school sports day. The Royal Wedding in 2018 really bought the whole school community together. Rather than an assembly about the Royals or weddings, as the majority of the children would never have attended a wedding we put on a Royal Wedding at school. 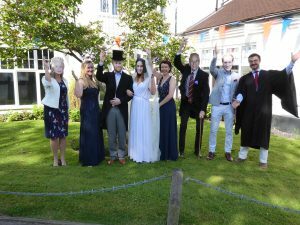 All the children received invites, wore patriotic red, white and blue and attended the ‘wedding’, in which staff took on the roles of the Royals. It was spectacular, and created an incredible buzz around school. Following the ‘ceremony’, we had a whole school garden party at lunchtime with themed wedding cake, followed by a parade with each year group having a theme. How do we know that it’s working? Statistics from our co-curricular programme show that children embrace the wider aspects of school life. Each week 51 clubs are on offer and on average each child participates in 3.6 clubs each week. All teaching staff offer a club, which are free of charge to parents. Specialist providers are bought in for more specialist clubs such as Fencing, Dance, Judo and Touch Typing. We have had strong leavers’ lists at 10+ and 11+, with children gaining places at highly selective schools such as: Kings College Wimbledon, Whitgift, Caterham, Reigate Grammar to name a few, with scholarships, including academic ones at prestigious schools such as Epsom College and Trinity. Most notably, we are successful in growing the school at a rapid rate. Pupil numbers increased by 20% from September 2017 – September 2018 and growth continues to be positive this academic year. What is the role of the school versus parents or the community? Parents can see that their children are happy, engaged and want to come to school. They have plenty to talk about at home, whether that be that they have been in a Victorian School for the afternoon, played in a match, been to Boogie Beats with the residents of the local elderly people’s home or written a persuasive letter to the Head about what they want at school. It’s about making learning real and something that can be shared. 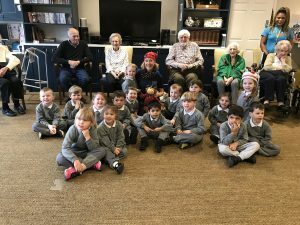 We have led community events for both the children and parents, which have been well attended and formed a parent body, the Banstead Prep Supporters who take ownership of these events and fundraise for those little extras. 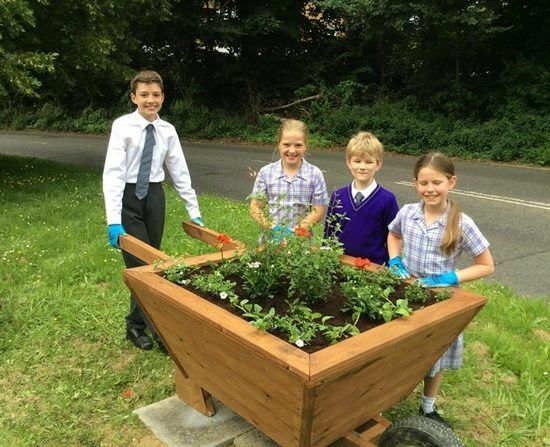 Amongst many tangible resources such as djembe drums, programmable robotic equipment, printing press, branded gazebos they have funded Easter eggs hunts, as well as a visiting pantomime for the whole school this Christmas. Recent research has examined the characteristics of the Millennial generation and how this relates to their behaviour as the parents of children at independent schools or considering independent education. This generation is more hands on and involved with their children’s education than older parents, and values brands that are authentic, honest and transparent. They place emphasis on wellbeing and health and want their children to develop practical and personal skills, as well as achieve academically. However, family time is important to them and because this generation is financially constrained, they are also very focussed on value for money. Education with Character speaks directly to this market and has enabled us to articulate a brand that is congruent with the attitudes of this important consumer group. This will be critical in attracting new families to the school in the future. This quote really sums up our belief and ethos at Banstead Prep.